Great Gatsby themed events to promote your brand! Good afternoon Dames and Gents, and welcome to the 1920s New York of the Great Gatsby; where the broads are dancing the Charleston, the gents are sipping whisky out of a teacup and the band is churning out some of the best jazz ever recorded. 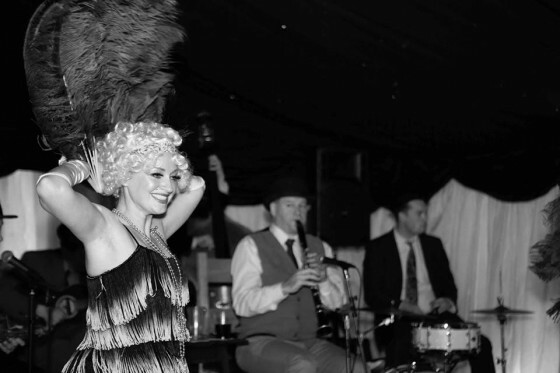 When we’ve worked with corporates in the past they’ve allowed us to fully transform their events into 1920’s speakeasy-style extravaganzas. 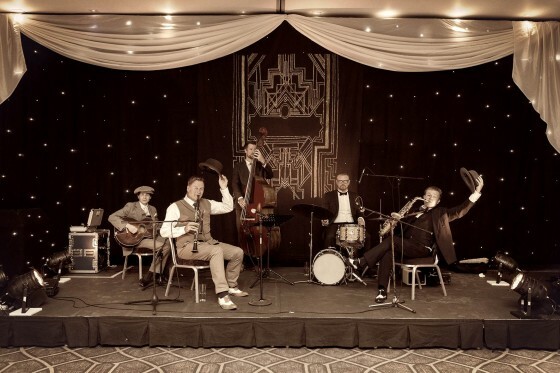 Our package deal for corporate parties includes our Great Gatsby-style band, scaled to suit your event as well as our fabulous Flapper girls – guaranteed to add a touch of class to proceedings. The combination makes for a great themed party. Often we’ve performed in branded gear but if you’d prefer we’re always happy to dust off the trilby’s to perform in full 1920s costume. We have worked at product launches, trade shows, costume balls and more. Whether it’s getting people to approach your stand or getting people to take a stand – on the dance floor – we’ve got you covered. So, if you want to take your brand or product back in time to the Roaring Twenties then get in touch.